South Africa was called the “Rainbow Nation” by Archbishop Desmond Tutu following the country’s first fully democratic elections in 1994, and Nelson Mandela said South Africa was, “a Rainbow Nation at peace with itself and the world,” as it was reborn into the post-apartheid era. Over the last 18 years, I’ve returned to South Africa again and again on motorcycle tours, safaris and game ranger courses. In that time, the stunning Rainbow Nation has become like a second home. Nothing gives me greater pleasure than sharing South Africa’s delights with visitors seeing its landscapes, meeting its people, and riding its roads for the first time. #1: Which Countries Border South Africa? South Africa has nearly 3000km of Indian Ocean and Atlantic coastline and shares borders with Namibia, Botswana, Zimbabwe and Mozambique. It also encloses Lesotho and Swaziland. #2: Where Is South Africa’s Capital? South Africa actually has three capital cities. Cape Town is the legislative capital, Pretoria is the administrative capital, and Bloemfontein is the judicial capital. #3: How Many People Live In South Africa? South Africa has a population of more than 47 million, around 80% of which are African. #4: What Currency Is Used? South Africa’s currency is the Rand, abbreviated as ZAR. There are 100 Cents in 1 Rand. Notes come in R10, R50, R100 and R200 denominations. #5: What’s The Weather Like? It’s not called Sunny South Africa for nothing! It has a temperate maritime climate (ideal for producing some amazing wines) and is loved for its long, sunny days. Rain falls during the Summer (November to February) across most of the country, except for the Western Cape which has rain in the Winter from May to August. #6: Does South Africa Have Good Internet Connectivity? South Africa’s communications infrastructure is generally excellent. There’s nationwide mobile phone network coverage and wi-fi Internet is accessible in most urban areas. However, don’t expect much when you’re out in the bush! #7: How Many Provinces Are There? There are nine provinces in South Africa: Eastern Cape, Western Cape, KwaZulu-Natal, Free State, Gauteng, North West, Northern Cape, Limpopo, and Mpumalanga. #8: How Many Languages Are Spoken In South Africa? There are 11 official languages in South Africa: English, Afrikaans, isiNdebele, isiXhosa, isiZulu, Sepedi, Sesotho, Setswana, Siswati, Tshivenda, and Xitsonga. #9: What Is The National Symbol Of South Africa? Like capital cities, South Africa has more than one national symbol. Other than the national flag, they include the blue crane, the springbok, the galjoen (a species of fish), the protea flower and the yellowwood tree. #10: Is The Water Safe To Drink? South Africa’s tap water is classed as potable and should be safe to drink in most areas. However, you’ll definitely need a good supply of bottled water when touring through remote areas. #11: Is There Malaria In South Africa? Most, but not all, of South Africa is thankfully free of malaria. 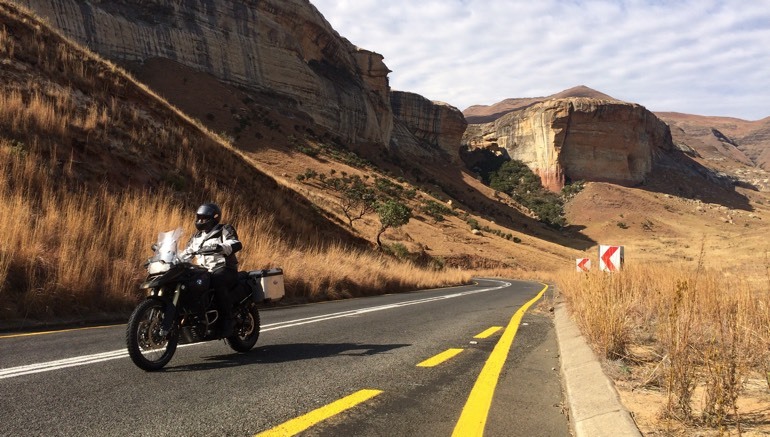 Kaapstad Motorcycle Adventure Tours don’t travel through areas where there is a malaria risk, but we always recommend seeking independent and up-to-date medical advice. #12: Is South Africa A Good Place To See Wildlife? It most certainly is! Among many other species, South Africa boasts healthy populations of the “Big Five”: rhino, elephant, lion, leopard and buffalo. #13: Will My Electrical Devices Work In South Africa? Of course, but bring suitable adaptors to make sure. The South African electricity supply is 220/230 volts AC 50 HZ. #14: Does South Africa Have More Than One Airport? South Africa is a large country and is served by three major international airports. OR Tambo International Airport in Johannesburg, Cape Town International Airport, and King Shaka International Airport in Durban. There are also 90 regional airports, including the Kruger Mpumalanga International Airport (KMIA) in Nelspruit. #15: What’s The Speed Limit In South Africa? The speed limit is 120 kph on main highways, 100 kph on secondary roads and 60 kph in urban areas. You can find out more about all the amazing experiences South Africa has to offer on the official South Africa Tourism website. Don’t forget to browse our motorcycle adventure tours too. Sept 2019 (1-10) - Sold Out! My Commitment to Fighting Poaching. Alex Jackson has been riding in Southern Africa since 1998 and is an experienced Bush Guide and Track and Sign Professional (Level 4) registered with FGASA (Field Guide Association of South Africa). 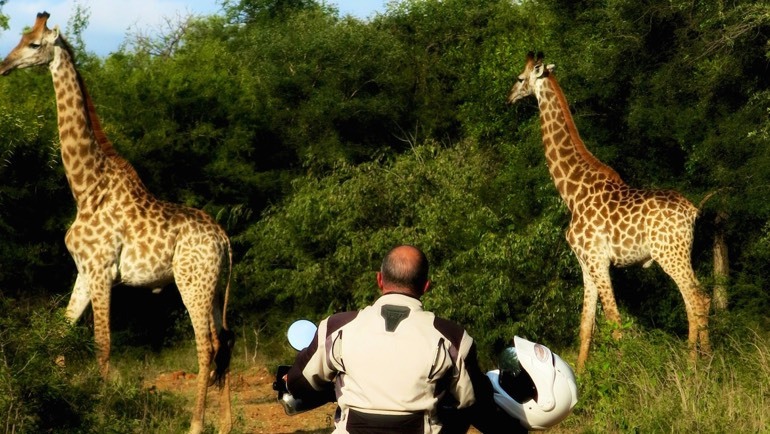 Kaapstad Motorcycle Tours offer guided riding vacations in South Africa, Namibia, Zimbabwe, Botswana, Lesotho and Swaziland, and is the only tour operator able to take groups of motorcycles through one of South Africa’s Game Reserves. All tours are lead by Alex himself. In September 2017 he lead the first ever motorcycle group into Kruger National Park. © 2017-2018 Kaapstad Motorcycle Adventure Tours Ltd. All Rights Reserved. 22 Harmill Business Park, Leighton Buzzard, LU7 4FF, UK.